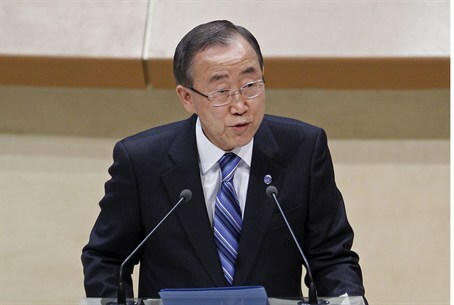 "Too many Palestinian civilians have been killed", says Ban Ki-moon as he urges Israel not to launch a ground operation in Gaza. United Nations (UN) Secretary-General Ban Ki-moon on Sunday night urged Israel to scrap plans for a ground operation in Gaza, saying that "too many" Palestinian Arab civilians have been killed, AFP reported. Repeating his call for a ceasefire, the secretary-general said he "feels a sense of responsibility for the Palestinians who, especially in the Gaza Strip, have long been denied the sense of freedom and dignity that they deserve," according to a statement released by his spokesman Stephane Dujarric. The situation in Gaza "appears to be worsening," Ban said, noting that the UN Security Council's call for a ceasefire had not been respected. Reiterating his condemnation of the firing of rockets into Israel by Hamas terrorists, Ban demanded an "immediate cessation of these indecent attacks." He also stressed, however, that "too many Palestinian civilians have been killed, and any Israeli ground offensive will undoubtedly increase the death toll and exacerbate civilian suffering in the Gaza Strip." "It is in the interest of both sides that steps toward dangerous escalation be replaced with immediate measures to end the fighting, thus preventing further casualties and greater risks to regional peace and security," the statement added, according to AFP. "(Ban) demands both sides move in this direction now." Ban’s statement came hours after the Palestine Liberation Organization (PLO) announced that Palestinian Authority Chairman Mahmoud Abbas would ask the UN to put “the state of Palestine” under "international protection". Israel reportedly offered Hamas a 40-hour ceasefire last week, sources said Sunday afternoon, which Hamas immediately rejected. Hamas has breached each ceasefire ever offered from Israel since rocket fire began in 2001, and has reiterated repeatedly during the current hostilities that they have no interest in a ceasefire arrangement. Israel, too, rejected a ceasefire over the weekend, saying nothing by a total cessation of rocket-fire against Israeli civilians would be deemed acceptable. Roughly 8,000 rockets have been fired on Israeli civilians since the 2005 Disengagement from Gaza.